Kannon temple in Shuri enshrines the gods of the years of Dragon, Snake, Mouse, Ox, Tiger and Horse. The writer of this article was born on the Year of Snake. Happy New Year to all of JU readers!! How was your New Year holiday on Okinawa? This New Year was very unusual as the weather was sunny and warm enough to wear short sleeve shirts, and a lot of families seemed to have fun during the holidays on Okinawa’s beaches. Touching ‘Daruma,’ the deity of a shrine of the same name, ensures health and good luck for the visitor. Still, popular shrines and temples were crowded with people visiting for their New Year prayers and the atmosphere was as usual except for the unusual warmth. 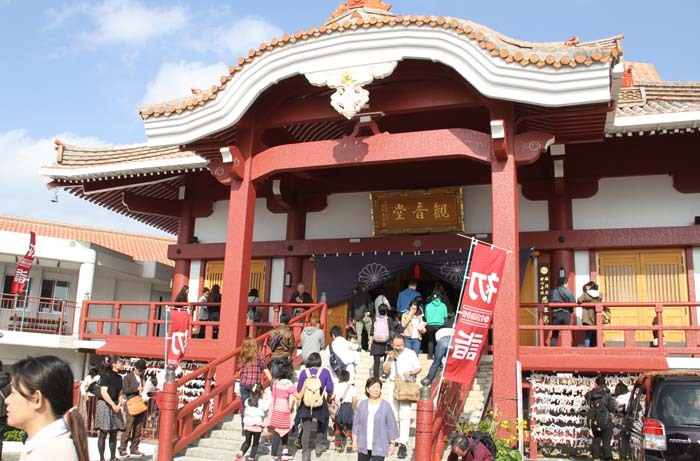 If you haven’t visited any shrine or temple yet, or even if you have, we would like to introduce a special way to visit a temple on Okinawa, specifically in Shuri area in Naha. As most people know, a Chinese calendar has a cycle of 12 animal symbols, one for each year, and one’s year of the birth is named after these animals. The year 2016 is the ‘Year of Monkey,’ and Japanese people often call people who are born in the year of the same sign “toshi otoko” or “toshi onna,” meaning “year’s man” and “year’s woman” respectively. So, if you was born in the Year of Monkey, you are a “toshi otoko” or “toshi onna” this year. 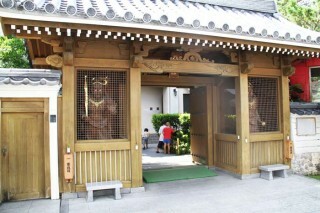 Entrance gate to Daruma temple in Shuri. 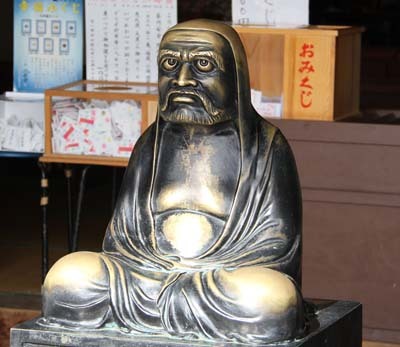 There are eight Buddhist statues called “Mamori Honzon” that in English means “Guardian God” and each has been assigned one or more animal symbols. But as they number only eight, four of them have two symbols. Since old times, Okinawan people have visited to pray in temples especially where their own guardian god has been enshrined. 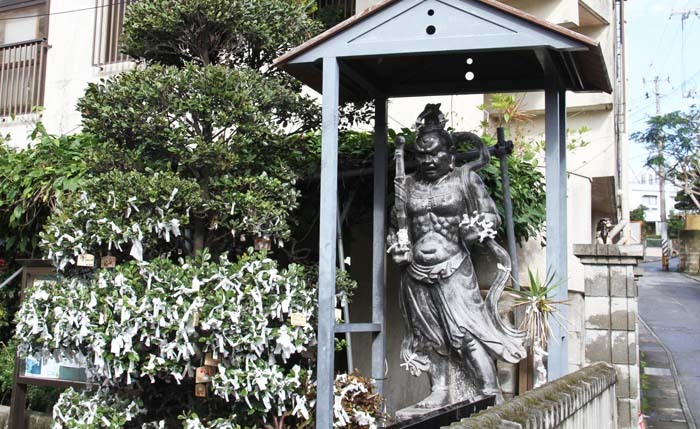 The four temples in Shuri are guardians of these ‘Mamori Honzon’ statues. The Seikou Temple enshrines the gods of the years of Monkey and Sheep, the Shuri Kannon Temple enshrines the gods of the years of Dragon, Snake, Mouse, Ox, Tiger and Horse. Ankoku Temple enshrines only the god of the year of Bird. Daruma Temple enshrines the deities of the years of Rabbit, Dog and Boar. All four of those temples are located in the Shuri district of Naha, near the Shuri Castle, and people call those temples “Places of the Shuri Twelve.” Visiting all four temples is called “The Tour of Shuri Twelve Places”. A deity guarding the entrance to the Seikou Temple in Shuri that enshrines the gods of the years of Monkey and Sheep. There used to be one more temple included in the group of “Places of the Shuri Twelve,” but the temple separated from the group years ago, and although it still exists as an active temple, it now belong to another group. To complicate matters more, ‘twelve’ in this case does not refer to the number of locations, but the number of the animal symbols. This custom is not so popular among younger Okinawans any more, but older people still visit the temple of their own symbol to pray, and of course, especially during the New Year. 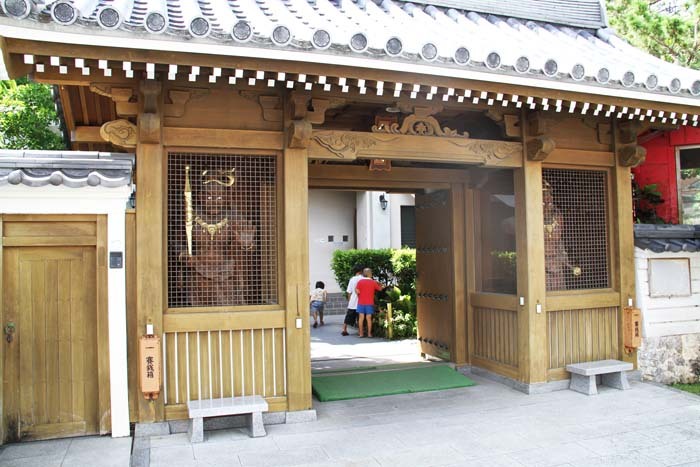 So, if you haven’t visited any temple or shrine yet, and want to do it in an old-fashioned way, check your own symbol, and visit the temple dedicated to your own symbol in Shuri one day early this year.